Hot Springs, NC, a resort destination for almost 200 years, has long been renowned for its healing hot mineral springs, scenic mountain setting, and abundance of natural resources. Recently voted the Best Small Mountain Town from Georgia to West Virginia by readers of Blue Ridge Outdoors Magazine, you will find we have a welcoming small town feeling. Hot Springs, NC is just 40 minutes north of Asheville. We are located at the junction of the Appalachian Trail and the French Broad River in a valley surrounded by the Blue Ridge Mountains and the Pisgah National Forest. Hot Springs is the only North Carolina town where the Appalachian Trail runs directly down the main street. The Hot Springs Welcome Center of Madison County is located at 106 Bridge Street, which is the main street in Hot Springs, North Carolina. It is located directly on the Appalachian Trail, across the street from the Post Office and next door to Gentry Hardware Store. Our goal is for the Center to be open from 10:00 am–5:00 pm daily. We have a manager and friendly staff at the Center. The Welcome Center is a new facility with approximately 1600 square feet. It is handsomely decorated and has comfortable furnishings and informative exhibits. There are bathrooms and free wireless internet and landline. The Welcome Center has excellent exhibits which will inform you about our fascinating history and the natural world. The Appalachian Trail Conservancy has an informative display, including footprints of local animals. The displays about area history include the following: the Buncombe Turnpike, which ran through town in the early 1800’s; a series of fabulous hotels which were built here; the German Internment during WW1; Cecil Sharp’s Collection of folk songs; and much more. Hot Springs, NC was voted by Blue Ridge Outdoors Magazine Best Small Town, due in large part to the natural resources and outdoor adventure opportunities that surround and abound. There are many businesses which cater to these activities and great spots to visit! The Hot Springs, NC climate is very moderate, making for pleasant year-round living and comfort. The town is nestled in a mountain valley created by the French Broad River. Surrounding town are the peaks and ridges of the Pisgah National Forest, with elevations ranging from 1,300 feet in town to over 4,600 feet in the mountains. In the summer, the elevation and surrounding mountains tend to keep the area cooler than other locations in North Carolina. Likewise, in winter the mountains protect the town from the harsh winter weather typically found at higher elevations. A wonderful aspect of the Hot Springs weather is the distinctive seasons. Each season is marked with its own wonderful characteristics that punctuate the year and add spice to the different holidays and and associated activities. When the topic of weather and seasons comes up with a group of Hot Springs residents or frequent visitors, there is a wide range of opinion about which season is the favorite and why. Spring is wonderful in Hot Springs as the town begins to emerge from the relatively mild winters. Spring starts in the valley where the sunshine warms the air, first bringing the crocuses and daffodils starting in late February or early March, followed by redbuds, dogwoods and flowering fruit trees. As spring emerges and leaves begin to cover the trees, the fresh green foliage makes its way up the mountains to higher elevations. You may watch from day to day as the bright green color moves up the side of Round Top Mountain and Hot Springs Mountain. It is during this time that the northbound Appalachian Trail “thru-hikers” begin to arrive in town. April starts festival season with the Hot Springs Community TrailFest, our annual celebration of the Appalachian Trail. Summer in Hot Springs is a great time of the year. June brings warmer days but the nights remain fairly cool as the air from up high on the mountains floats down into the valley. July is the area’s warmest month and it’s a great time for swimming in a mountain creek or rafting on the French Broad River. A journey to higher elevations on the summit of 4,629′ Max Patch Mountain will cool you down as temperatures tend to be 10-15° lower than in the valley. Fall is a spectacular time of year in Hot Springs, NC. You may begin to feel the coolness in the air in late August, and by September the days are generally cooler and nights are pleasant. Color starts to arrive as early as mid-September in some of the trees, particularly the dogwoods, which turn red very early. Mid-October through the end of October is the peak time for fall color, although the show extends well into November. Fall is the reverse of Spring: leaves change color at the higher elevations first, and the brilliant shades move from the mountaintops gradually down to the valley floors. A drive around the nearby communities of Spring Creek and Shelton Laurel is a perfect way to experience this beautiful phenomenon. Winter doesn’t really arrive in Hot Springs until January. December weather is chilly, but pleasant. Even during January, the average daytime temperature is well into the 40’s and the nighttime average is only in the low 30’s to upper 20’s. Most days are bright and sunny making for particularly good hiking. With the foliage down, views from the mountain trails are expansive and the long vistas make visible the structure of the mountain ridges. Also, the elegance of the bare tree branches contrasts with the lush green of the evergreen plants. As such, rhododendron, laurel, pine and hemlock add to the unique beauty experienced only during winter hiking. A nice feature of the winter weather in Hot Springs is derived from the topography. Because the town is in a slightly warmer valley, it is largely protected from snowfall. When snow does fall, it does not last long. The 2-3 inches in town might correspond to 10-12 inches in the surrounding mountains that are at higher elevations. It is not at all unusual for us to have a dusting of snow here in town but be able to see the nearby mountaintops gloriously white with new fallen snow for several days. In winter, if it’s snow you want, you will find it at higher elevations like Max Patch or Wolf Laurel. By February, the winter days start growing longer and temperatures rise most days into the high 40’s and low 50’s. Many accommodations in Hot Springs have fireplaces so they are toasty warm and very inviting. The hot mineral springs are open year-round and, with water temperatures of 102-103 degrees, a soak in the springs is great even in the coldest of weather. In fact, many people prefer a hot soak during the coldest weather. Then when Valentine’s Day arrives in Hot Springs, we know that our short winter is beginning to end and spring is just around the corner. Hot Springs, North Carolina, a resort destination since the early 1800’s, has long been renowned for its healing mineral springs and scenic mountain setting. Native Americans were the first to discover the 100-plus degree mineral water from which the Town of Hot Springs received its name. They often held spiritual ceremonies about five miles down the French Broad River at Paint Rock where some of North Carolina’s best known example of an American Indian pictograph can still be seen today. Traders from the colonies came next and, by 1778, the lame and the sick were traveling over the mountains to the hot springs for the healing waters. On March 19, 1791, William Nelson bought the hot springs property for “two hundred pounds in Virginia currency” and began catering to the visitors. Buncombe Turnpike was completed along the French Broad River through Hot Springs (called Warm Springs at the time) in 1828, connecting Tennessee and Kentucky to the east coast. It was the superhighway of the South at the time. Farmers drove thousands of horses, cattle, hogs, and other livestock to markets in Charleston and Augusta on the Turnpike and stopped in Hot Springs to take the waters along the way. Recognizing the potential for tourism, James Patton of Asheville, bought the springs in 1831 and by 1837 had built the 350-room Warm Springs Hotel with thirteen tall columns commemorating the first colonies. Because of it size and grandeur, it was called Patton’s White House. Its dining room could seat 600. The next owner was James H. Rumbough, a stage coach operator, who bought the springs in 1862. In the hotel’s ballroom, second largest in the state, Frank Johnson, son of President Andrew Johnson, met his bride, Bessie Rumbough, daughter of the hotel owner. The railroad reached the village in 1882, and it was necessary for Rumbough to enlarge his hotel. Two years later the hotel burned, and the springs and much of the town were sold to the Southern Improvement Company, a northern syndicate. The Mountain Park Hotel was built in 1886, and a higher-temperature spring was discovered, prompting the company to change the town’s name from Warm Springs to Hot Springs. 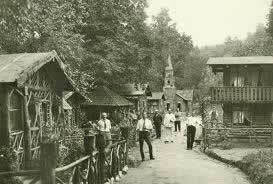 The Mountain Park was one of the most elegant resorts in the country during its heyday. It consisted of the 200-room hotel, a barn and stables, a spring house, and a bath house of sixteen marble pools, surrounded by landscaped lawns with croquet and tennis courts. The Mountain Park Hotel established the first organized golf club in the Southeast with a nine-hole course. By May 1917, however, fewer and fewer people were taking the waters, and the Mountain Park Hotel and grounds were leased to the federal government as an internment camp for hundreds of German merchant sailors captured in U.S. harbors when war was declared. The internees were treated well by the townspeople, and several returned to visit after the war. When the war ended, the Mountain Park Hotel never regained its former glory. The hotel burned in 1920, never to be rebuilt. Two other hotels were built on the grounds of the springs during the next forty years, but neither were as grand as the Warm Springs Hotel or the Mountain Park. Both of these smaller hotels also succumbed to fire, and the Town of Hot Springs was nearly forgotten as a tourist destination. Hot Springs is again a haven for those seeking a relaxing and healthful mountain retreat. Outdoor recreation abounds. Hikers can explore some of the scenic stretches of the 2,100-mile Appalachian Trail, which runs down the main street of Town before crossing the French Broad River and climbing back onto the ridgetops. Rafters can shoot the rapids on the French Broad River. Mountain bikers can wind along wooded paths to open meadows with commanding views of the surrounding peaks. Those seeking time for relaxation can simply savor the area’s breathtaking scenery while soaking in hot mineral baths in secluded outdoor tubs at the reopened Hot Springs Spa. Hiking Tours focused on this fascinating history are available with the Hot Springs Tour Co.
Reference: “The German Invasion of Western North Carolina,” written by historian Jacqueline Burgin Painter (Biltmore Press, Asheville, NC 1992). Hot Springs Shops and Book Stores also have great historical info! Hot Springs is located within beautiful Madison County, a gem of the Blue Ridge Mountains in Western North Carolina near Asheville. While the U.S. has nineteen counties by the name of Madison, our Madison County is the only one that is home to over 55,000 acres of the Pisgah National Forest and has, as a majestic backdrop, the French Broad River, thought to be the third oldest river in the world. The majesty of our natural surroundings combines with the heritage of our three small towns, our timeless mountain music and delicious food offerings to make Madison County a most desirable destination. We offer outdoor activities for enthusiasts of all ages that include hiking, whitewater river rafting, tubing, cycling and horseback riding. Also available are soaks in the natural hot springs that are among only a few such springs found east of the Mississippi River. Come to Madison County and you will experience life as it can be… easy living with a song in the air. Visit the Madison County website for more information. Want to move to Hot Springs? Due to its moderate climate, beautiful scenery, and wonderful mountain traditions and culture, Western North Carolina is a popular relocation destination. Hot Springs and its surrounding communities offer a wide range of housing and land options. There are several very capable realtors in the area who welcome the chance to assist you in finding the perfect property. There are also some excellent builders and craftspeople who can renovate a cottage or build a new home or log-style cabin. For those who prefer a small community, Hot Springs has much to offer. We have all the basics, plus the city of Asheville is only 45 minutes away. Hot Springs proper is a community of 650 people with a municipal government and full water, sewer and other public services. South of Hot Springs, on Highway 209, is Spring Creek, an unincorporated community with much to offer those who prefer a more rural setting. Many Spring Creek residents have 5-10 acres or more. For hundreds of years, Hot Springs has attracted visitors from all over to soak in the natural hot mineral water. The Appalachian Trail brings over 2,000 visitors each year from all over the world. Many finish their journey and return to Hot Springs to settle. As a result, the town is welcoming to people from different areas and walks of life. In large part, people are drawn to the area for its natural beauty and outdoor recreational opportunities. Hiking, fishing, and wildlife viewing are bountiful here. With a tradition of arts and crafts going back to the early settlers, Hot Springs is popular among families from the area as well as newcomers who have an appreciation for handmade crafts. One would be remiss not to mention the tradition of music in the mountains which has its heritage in the Irish, Scottish and other settlers to the area. On any given weekend, there are opportunities to enjoy mountain music and traditional country ballads. With the advent of the Internet, many people have moved here from elsewhere and telecommute to their jobs or businesses. High-speed Internet Service and Cellular Phone Service is available in town and surrounding communities. Many people have moved here and opened local businesses. We also attract active retirees, many of whom enjoy outdoor activities, gardening and area crafts.